There are several causes of a rash on the chest and back of a toddler. These rashes are usually benign, but can cause discomfort to the baby and consternation to the parents. It is important to identify the rash and any other accompanying symptoms to try and identify potentially serious causes that might require treatment. According to the Merck Manuals, known causes of rashes in this age group include irritation and bacterial, viral and fungal infections. Other causes include allergic reactions, skin dryness, eczema or atopic dermatitis, and heat rash. According to the Palo Alto Medical Foundation, viral illnesses most commonly cause generalized rashes in babies and toddlers. The appearance of the rash can help identify its cause and potential treatments. 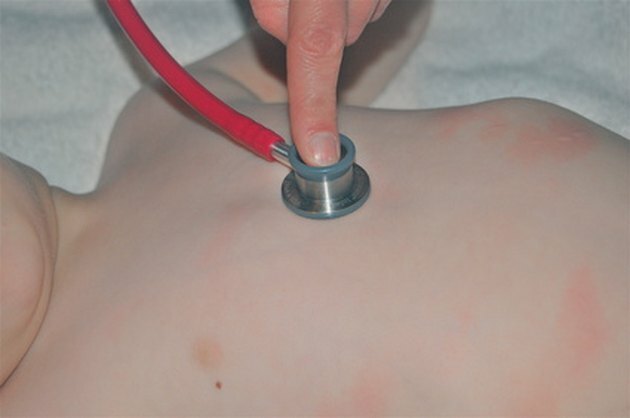 Viral rashes often appear as small, red bumps on the toddler's chest and back. Other viruses, like chickenpox, start as small red bumps that become clear vesicles, which eventually scab over. An allergic reaction appears as urticaria or hives, raised itchy red welts on the skin surface. Eczema appears as patches of dry, scaly skin that can become infected with bacteria when scratched continuously. Rashes in toddlers can be accompanied by other symptoms. Upper respiratory infections, like colds and ear infections, can precede the appearance of a viral rash. Measles and other viruses can also cause conjunctivitis, or pink eye, and swelling of lymph nodes. Fevers are another common symptom with viral rashes. Itching is a frequent symptom in toddlers with allergic rashes, eczema and chickenpox. Most rashes will go away after a few days. Allergic symptoms of runny nose and itching can be treated with over-the-counter oral antihistamines, like diphenhydramine, or ointments like calamine. This also helps the itching associated with chickenpox. Moisturizing lotions are important in the management of eczema, but severe cases may need treatment with topical corticosteroids. Bacterial super infection due to frequent scratching may require topical or oral antibiotics. Certain rashes and symptoms should alert parents and health providers to potentially serious conditions. A toddler with a rash that appears as pinpoint purple lesions or large violet-colored patches of skin and high fever could be suffering from meningococcemia, a potentially lethal bacterial infection. Children with any rash, fever and changes in mental status, like lethargy or listlessness, need to be evaluated for the presence of meningitis, an infection of the lining of the brain. What Causes a Rash Over a Child's Entire Body? What Are the Causes of Rash on a Child's Face & Around the Eyes?